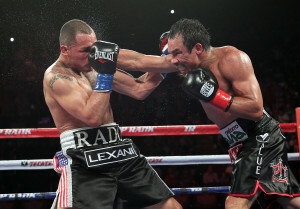 Mexican Independence weekend in Las Vegas is the place to be for boxing fans. This Saturday, September 15th, Box Fan Expo will be back in Las Vegas at Las Vegas Convention Center at 10am for its 4th annual event coinciding with the rematch of Canelo Alvarez and GGG Gennady Golovkin. Box Fan Expo is the ultimate boxing fan experience, which gives boxing fans the opportunity to engage with top fighters, current and former world champions and boxing celebrities from the boxing industry in an up-close setting. The general public tickets are still available and start at $30. With so much to see and do at the Box Fan Expo event, it can be a bit overwhelming to know exactly where to start, so we’ve put together our list of top 3 things you have to check out. This is the perfect occasion to see boxing’s next megastar. Several highly-ranked and top fighters from the USA boxing amateur program will receive a special invitation to take part at the inaugural Box Fan Expo Invitational 2018. This year’s Expo is sponsored by Mayweather Promotions and Adidas. you’re sure to find great swag! Hats, shirts, gloves and boxing equipment can always be found at the event. Fighters that have already confirmed they’ll be in attendance are Errol Spence, Mickey Garcia, Andre Ward, Juan Manuel Marquez, Jessie Vargas, Thomas Hearns, Marco A. Barrera as well as female fighters Maricela Cornejo and Mia St. John and many more. Many boxing stars have attended the last three Expos such as Floyd Mayweather, Mike Tyson, Roberto Duran, Tommy Hearns, Marco Antonio Barrera, Roy Jones Jr., Marcos Maidana, Sergio Martinez, Keith Thurman, Danny Garcia, Tim Bradley, Deontay Wilder, Amir Khan, Shawn Porter, Fernando Vargas, Zab Judah, James Toney, Vinny Pazienza, Mikey Garcia , Mia St.Johns, Leo Santa Cruz, Badou Jack, Terry Norris , Riddick Bowe , Earnie Shavers, Leon Spinks, Danny Jacobs, Abner Mares, Jorge Linares, Brandon Rios and many more.